Mr. Brown's P.E class, means fitness. We play badmitton, we do cool tricks with jump ropes, run, and many other things. We also do fitnessday. Fitnessday is a day where you have to run for like a mile or for 10 min non-stop. It is really exahausting. P.E is really fun though, because for 45 min we don't have to worry about any other subject. In Mr. Brown's P.E class, this year, we are playing badmitton. Badmitton is a game that requires a raquet and a birdie. A birdie the little soft thing in the picture to the left. It is really soft, and when it hits you it fells like nothing even happend. This is a really fun game. It is just like tennis. 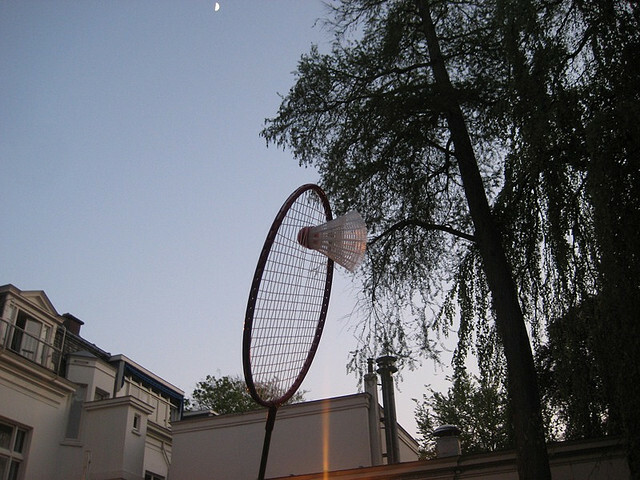 The object of the game is to hit the birdie over the net. It is really easy, but can be kind of hard. You can play by yourdelf with another person, or you can play doubles. Doubles are when there is a team of two are playing against another team of two. Badmitton is just like volley ball and tennis. I connected this to volley ball, and tennis. This is what I got. I am pretty good at badmitton. It is really fun, and keeps you focused. I would reccomend this for people who really know how to play tennis or volleyball. We go out to play badmitton 3 days out of the week, and the rest of the week we go excercise in the excercise room. For P.E, we are doing karate. It is very complicated. You have to learn a lot of steps. For P.E, we are doing a 20- step pattern. This pattern included kicks and punches. This picture is almost like the piece of paper that Mr. Brown gave us to memorize. 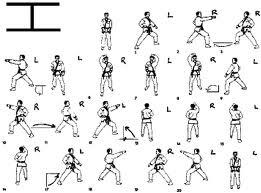 In case if you did not know, a kata, is a performance that you do for karate. The letter "I" at the top, represents the way we have to move for the twenty step pattern. It is very hard. Some people call the "I" an "H". Either way it makes know difference. Click the picture for a larger image, so you can try to practice it. Let me warn you, it is very difficult! The connection that I made this to was dancing. Dancing is hard at first, bt then it becomes a little more easier If you practice a lot though, you can exceed at it!